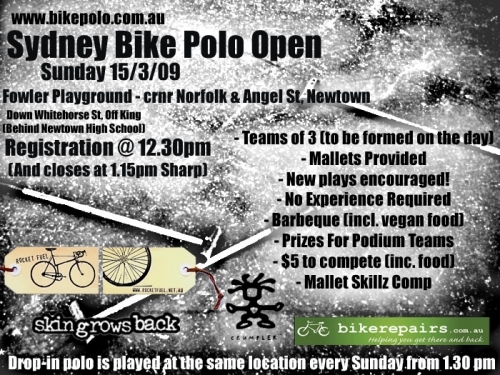 This entry was posted by Doug D on February 8, 2009 at 12:01 am, and is filled under Australasia, Bike Polo, Events-Past. Follow any responses to this post through RSS 2.0. You can leave a response or trackback from your own site. The Sydney Bike Polo Open was a huge success with 11 teams participating. Congratulations to Team SCS who took out first place, in a close 5-3 match against the Team Coopers. Congratulations to Jen, from the third placed team, for taking out the “Best New Player” award. Thanks to the sponsors: bikerepairs.com.au, Skin Grows Back, Deus and Rocket Fuel for all the prizes on the day. Extra thanks to Mitch’s parents for cooking the BBQ.